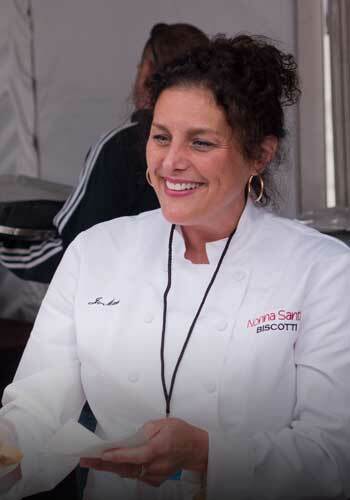 Jo-Marie Frigo, owner of Nonna Santi's Biscotti, supplies Chicago with traditional, Italian biscotti, based on her Nonna's recipe from Tuscany. Working as a decorative painter in some of Chicago's finest Italian restaurants, she would bring her biscotti in as a treat to share with staff. A trip to Italy and enthusiastic words from restaurant chefs and friends prompted Frigo to take her cookies commercial. Nonna Santi's Biscotti can be found in Chicago's local Whole Foods, Panozzo Italian Market, Dirk's Fish and RL Restaurant. Along with her traditional anise seed-walnut biscotti, other flavors include olive oil-orange-walnut with sea salt, as well as seasonal flavors. Great with coffee, tea, wine or beer... the olive oil-orange-walnut biscotti pairs perfectly with your favorite brew! Enjoy!